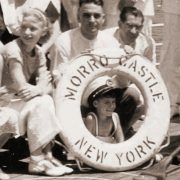 Jim Kalafus continues the tragic story of the Morro Castle. My wife, Rose, and I were awakened at 3AM, not by any member of the crew, but by the passengers. They told us the boat was on fire. Mrs. Lerner and I rushed out to the deck: we were on A Deck, the top deck. Flames were beating all around. 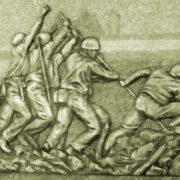 There were no ships officers in sight and what members of the crew there were around did not seem to know what it was all about, or what to do. I ran around looking for one of the ship’s officers and I couldn’t find one. When I came back to Mrs. Lerner the flames had driven the people on that deck to the rail. The cables on a number of lifeboats had burned through and the boats were dropping off into the water with no one in them. The men and women started jumping off. Mrs. Lerner and I had our lifebelts on and we jumped. It must have been almost 60 feet to the water- I was pretty nearly knocked out. I looked around to try and find my wife, and called, but didn’t get an answer. The three of us jumped together, Dr. Busquet, I and Ofelia. We hit the water so hard that the lifebelts smashed against our heads with such force that we were practically knocked out for several minutes. When it was obvious we’d be in the water a long time we held hands. After riding the waves together for many hours, my husband suddenly gasped “I can’t go on!” It was terrible. Shortly after he was swallowed up by the sea, the City of Savannah loomed upon the horizon. 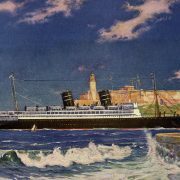 Dr. S. Joseph Bregstein, (1899-1972) a dentist from Brooklyn, remains one of the best known of the Morro Castle survivors. 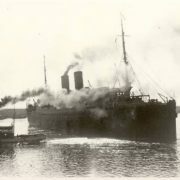 Interviewed late in life, he recounted that his purpose for being aboard the ship was to discuss his pending remarriage with his 8 year old son, Mervyn, in a pleasant environment. According to Dr. Bregstein, the environment was less than pleasant – a crew member slipped a nail into a lamb chop Dr. Bregstein had custom ordered for his son on the last evening – and the father son talk did not take place. Mervyn died in the disaster, and his was one of the 40 or so bodies never recovered. I was awakened in my cabin on D Deck around 4 o’clock by the pounding of someone on the door. “Fire!” they were shouting “get up and get out!” I took it lightly at first, but I roused my boy, putting on a topcoat over everything else, and giving him a raincoat. We dressed quickly and went up to C Deck where there was water three or four inches deep. I had forgotten to take lifebelts. I was about to return when the lights went out. Everyone was rushing, and in the dark I was afraid we’d be killed. On C Deck men were fighting the fire with a hose. We were warned the deck was not safe, and we went back to D Deck. Anyway, by now the flames were creeping down the stairs. By 5:15 the pressure from the hose stopped.. I got up on deck, higher up, and we were cut off by the flames. You know what happened then. 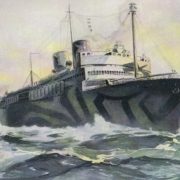 What happened then, was that Dr. Bregstein was approached by an onboard acquaintance known to him as “Florence.” She was going to attempt to swim to safety, and persuaded Dr. Bregstein to allow her to take Mervyn overboard; assuring him that she was a strong swimmer. The father told his son not to be afraid and to hold on to the lady with the lifebelt, and the two went overboard around 6:15 AM. Miss Knight said she swam around in the water, the boy with her. She grew exhausted. She had a vague recollection of feeling that she couldn’t continue any longer. Others were swimming near her. Somebody, she recalled, “took the boy away from me.” Then she lost consciousness and was picked up by a lifeboat and brought to shore. She divined who the father of the boy was through newspaper stories. 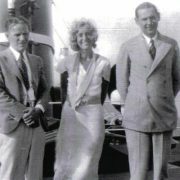 However, as it developed, the child whom the Knight sisters took overboard with them was not Mervyn Bregstein, but Benito Rueda, the son of Mrs Julia Rueda of New York City and Havana. A reunion was staged between the Rueda child and his rescuer, and the boy made a hit with the press by saying that he would grow up to marry her out of gratitude. Initial accounts were in agreement that it was Benito and Dickie Rueda with whom the sisters swam, and it was only after Ethel ‘recognized’ herself as Dr. Bregstein’s Florence that Dickie vanished from the narrative. Ethel Knight married William Celatka, only to die of a heart attack within the month. She and her sister Gladys are still remembered as the women who tried to save Mervyn Bregstein and failed.